Does anyone else feel like singing Grease? Cause I sure do. But I'll resist the urge. This is still a great picture though. your making cee-lo green angry ! ...The 50's existed far before any modern-day music artist decided to rip off Mowtown. Is that one of those "5-dollar shakes"? "this is what will if Mike leave Sandy"
Then travel back 50 years in time. or maybe the 50`s yeah the 50`s.. But mike is black and it's the 50's so wouldn't he get kicked out of the diner and sprayed with a fire hose? also cute as all that and more!!! SOOOO CUTE!!! Ahh the ancient days, when is this, like the 80's? This could totaly be on a bottle of coca-cola® that's prolly wwhat my first art is goin to be. Anonymous #10 8 years ago. 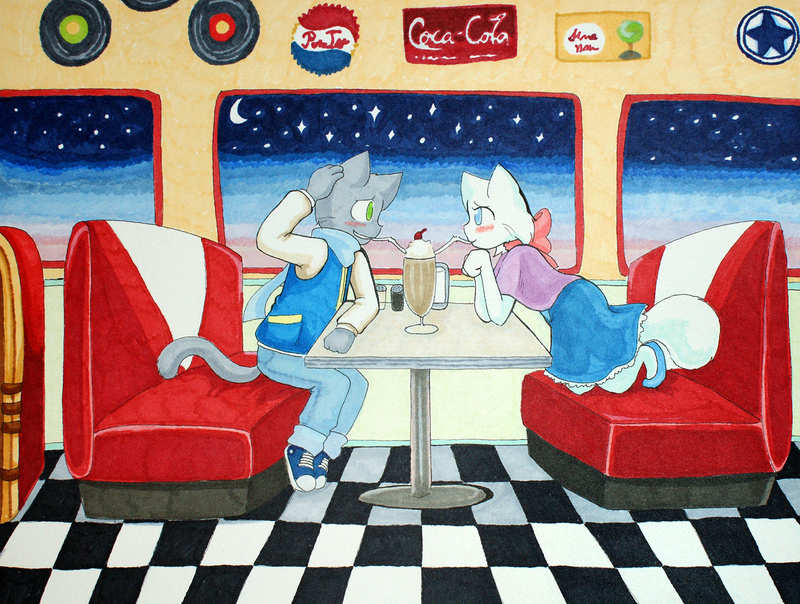 BCB if it takes place in the 1950's.